2 bed NEWLY DECORATED, spacious, fully equipped and relaxing bungalow at Cabopino Park, Marbella. 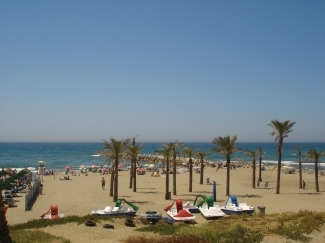 Cabopino Park is one of the most sought after parks on the Costa Del Sol and is located within walking distance of shops, bars and resturants and the gorgeous Cabopino Beach, one of the best along the Costa Del Sol. 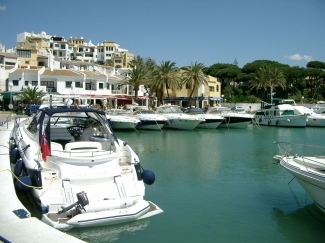 Also 5 minute walk away is Cabopino Port. The site is surrounded by a 5* golf course. Beautiful large indoor pool and outdoor pool. Onsite bar and snack bar. Famous Bruno�s restaurant visited by many stars (and one other restaurant). French boules, outdoor gym facilities, table tennis and a football pitch. The bungalow is fully air conditioned with a large living room, kitchen, bathroom, conservatory/dining room and a veranda area with outside seating and sun beds. It is only 45 minutes from Malaga airport (transfers can be arranged) and is quite centrally based with just a 15 minute car journey to Marbella, Puerto Banus, Fuengirola and Malaga Town. Calahonda is just next door and many residents feel that there is no real need to travel anywhere when you have everything on your doorstep here. Bus stop directly outside site. Please contact us for any more information or details. These prices are based on 4 adults sharing per week. Sleeps 6-extra cost per additional person/s. We do have contacts for other homes if there are more than 6 people. NO GROUPS OF ALL MALE/FEMALE. �150 deposit required to secure booking. �150 housekeeping bond required on booking to cover accommodation. Electricity and damages will be deducted from this and the remainder will be given back on day of departure.